The 80-20 rule in business states that 80% of your revenue comes from 20% of your customers. For the sake of argument, let’s say that you have sales of $10,000 generated by 25 customers; according to the 80-20 rule, 80% of your sales ($8,000) was made by 5 customers (20%). Do you know which of your customers contribute the most to your bottom line? Can you name them off the top of your head? Can your employees name them? If not, this is a problem to be addressed immediately because those customers are the pillars supporting your small business, they deserve some extra attention. It is important that you and your employees know them and work to keep them happy. The loss of any of those top clients can have serious consequences.Sure you say that’s why we use most of our marketing dollars trying to acquire new customers. But, did you know that depending of the industry; it costs 3 to 10 times more to attract a new customer than it does to sell to an existing customer? If you are a startup with zero or very few customers, it makes sense to spend most of your marketing dollars getting new customers. But, if you are an established business, the best profit boosting opportunities lie in optimizing the relationship you have with your existing customers. Find out who your best customers are. They are the ones who give you repeat business and recommend you to their friends, don’t ask for a discount, pay you on time, and/or will write great testimonials. Take an inventory of the products and services that you currently offer. Rank them by order of profitability and categorize them from 1 to 5. Ones should be the products/services that are the most profitable; fives those products and services that are the least profitable. Create a grid with clients on top, and your offerings down the left side. Then go through and for each client check the offerings you provide for them. Start with your 20% first (or your 5 most impactful customers) and work your way across your client list. Any box without a check mark represents an opportunity for you to solidify your relationship with your customers and boost your profits. You can do it by educating your customers about the additional products and services that you offer with blog posts, social media posts, videos and/or newsletter. As you work on your grid you’ll probably find out that some of your clients purchase most if not all your products and services. Those are your FANS; they just love what you do. Interview those fans and learn from them. Are they a fan because of a particular person in your company? Find out what this team member is doing that’s working so well. Or maybe they found a way to use your product(s) that you did not think of. Within those interviews lies profit boosting information that you can apply to the rest of your customers. Now that you know who your best customers are and what they purchase; take it one more step and find out what they have in common. Do they share the same zip code, profession, social/ church affiliation, preferred social media platform, etc.? How did they first hear about your company? What are their preferred social media platform(s)? Eliminating less profitable services – Did you know that Steve Jobs dropped 70 percent of Apple’s product line so his company could focus on the 30 percent of products that generated results? Engaging with marketing partners – A marketing partnership is a collaboration between two or more businesses that either share a current customer base or a related one so that they are able to market their products or services to new and qualified audiences. 20% of your website pages get 80% of traffic. Identify those pages using Google Analytics and update them with new and relevant content. No need to overhaul your entire website, unless your site isn’t responsive. In this case, you need to update it to improve your customers’ experience and convenience online. 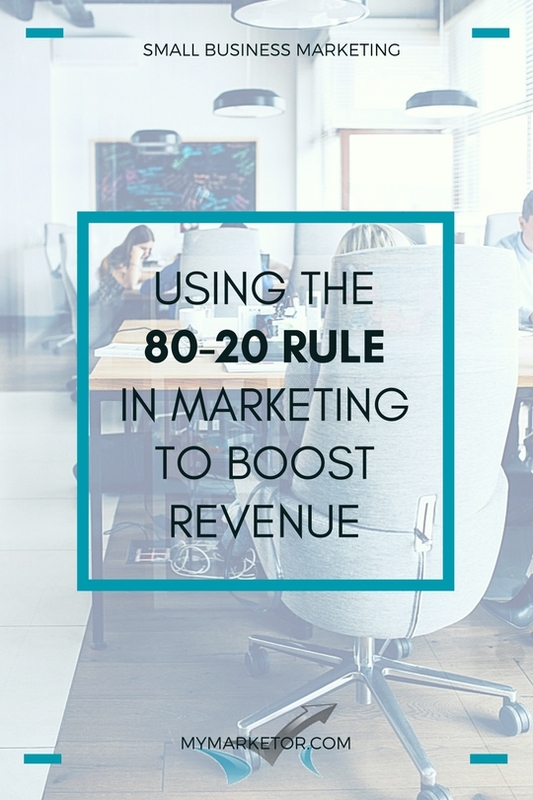 Applying the 80-20 rule in marketing can help you refine your marketing strategy, save time and money and increase your business revenue.